Last week I was remarking to some friends how odd it seemed that I only got two swallowtail caterpillars this year, when I have so much dill and parsley and carrots in my garden. Then Sunday night around 9 p.m. I went outside to pick some dill for my dinner, and when I came inside I realized I had brought in one caterpillar and one egg. I went back outside to pick some longer-stemmed dill for the caterpillar to eat, and with that dill brought in another caterpillar. Monday morning I went out in the daylight and made a formal search and found one more caterpillar and one more egg. Tuesday I went out twice and came back with a total of ten more caterpillars. Today I only did a quick, cursory check, but I'm kind of afraid to look too closely because 15 caterpillars (well, 14 since one of the eggs hasn't hatched yet) is already kind of overwhelming. All the caterpillars were first or second instar, although several have molted since I've brought them in, and with fifteen of them I can't really be expected to keep track of who's doing what. All the new batch of babies were found on dill, although I don't think that's necessarily because dill is a preferred larval food plant but rather because they are just easier to see on dill, and I wasn't turning over every leaflet of parsley or carrot greens. 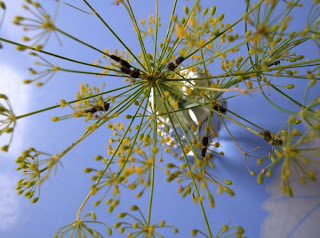 I also noticed that my neighbor's dill, which has been judiciously pinched back, seems to contain no caterpillars, while mine, which I mostly neglected and which has mostly gone to flower, is full of them. My neighbors could be picking off caterpillars (some gardeners know swallowtail larvae only as "parsley worms") or he could be raising his own caterpillars or the adult butterflies could prefer flowering dill for some reason. The caterpillars will eat the flowers, although they seem to prefer the leaves, but I wonder if the flowers are more nutritious and the mother butterflies are looking out for their children's welfare. Or the adult butterflies could have been attracted to the flowers for nectar, and just happened to lay their eggs there. Meanwhile my remaining chrysalis from before remains a chrysalis, although he really should be hatching any day now. More news as events warrant.